Our new project was brought to our attention by an interior designer by the name of Michael Russo, a very talented ID with an incredible eye. We sat down and began to figure out exactly what the client was looking for, the large space, about 18′ wide x 40′ long, was completely undeveloped. The owners wanted a wine cellar and tasting room – something timeless and elegant, modern with an “old world feel” – something that looked like it had been in the house for years. After finding out how many bottles (and what sizes) the customer needed (in this case 1,000 and room for 750’s and some 3ltrs), it was imperative to determine the exact type of 750ml because of all the different size 750s on the market now. We decided to create an incredible visual with our “Chevron” style wine racks (which allow for all 750ml sizes and the large format). Then we selected white oak (natural) as the wood species, and to add a coffer ceiling because that was just too simple. Next we decided to add a grayish brick in all of the coffers, wine room ceiling, backsplash of the butler’s pantry, and a niche we created when we framed the room. J&C did all of the construction on this project including the butler’s pantry, glass, tile, sheet-rock, coffer ceiling, masonry, hvac, and of course the wine racks and cabinetry. The owners plumber was used for the plumbing and the fire sprinklers, which needed to be moved as per the Town of Harrison. The coffer ceiling has LED lighting hidden in the crown for a “glowing effect”, as well as in the wine racks, which creates an amazing visual that the owners and their guests love. The wine room has a clear glass front which allows views into the wine room from every angle, the butler’s pantry has a sub-zero fridge, ice maker, dishwasher, and a copper sink. We did 3″ Correa marble counter tops and several shelves for liquor display and decanters. All of the cad work, materials and engineering were supplied by Joseph & Curtis. Michael Russo was there at every stage, bouncing ideas and finishes back and forth which made the project move at lightning speed. Overall the project came in on time and on budget … as always. At Joseph & Curtis Custom Wine Cellars – we dream in red and white. Contact us and we will design the cellar of your dreams! 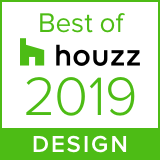 So humbled and blessed to receive the Best of Customer Service for the seventh straight year, and Best of Design for second straight year! Two things Joseph and Curtis Custom Wine Cellars take tremendous pride in #1 Happy Customers and #2 Designs that are unique and constantly pushing the envelope. Thank you to our incredible employees, vendors, family, and most importantly our customers! Joseph & Curtis Custom Wine Cellars introduce two new custom wine rack designs for 2019. Bespoke. Handcrafted in America. Every great collection deserves a gallery. Let Joseph & Curtis Custom Wine Cellars create one for you. The classic Chevron pattern which is French in origin and dates back to the late 14th century. These zig-zagging lines which meet at angles create a visually elegant pattern and a sharp, intended contrast to the circular shape of the wine bottles. We back light these wine racks to create a beautiful halo of light that repeats the Chevron pattern for an stunning presentation of your wine collection. WineWave is an original Joseph & Curtis trade-marked design that follows the soft contours of a wine bottle for a harmonious combination of wine storage & display. These metal wine racks are hand made and can be done in raw carbon steel with natural patinas or stainless steel as well as powder coated to any color imaginable. As always, Joseph & Curtis signature custom LED lighting experts play a big role in the overall visual result of these one of a kind custom metal wine racks. Contact us today and we’ll bring your wine cellar dreams to life! Joseph & Curtis Custom Wine Cellars recently completed a custom wine cellar in Sea Girt, New Jersey. This home has panoramic views of the ocean and the owner wanted panoramic views of the custom wine cellar that is positioned adjacent to the kitchen. We kept it light and airy as a nod to the beach house feel. This steel and glass custom wine cellar floats the wine collection on metal wine racks. The glass wraps around a bar area to create a beautiful wine wall back drop when entertaining. Pour a glass of red and enjoy the views. Hoboken New Jersey, the birthplace of Frank Sinatra, sits across the Hudson river from NYC. Stately brownstones line the streets that parallel Washington Ave, the main thoroughfare that runs thru the heart of Hoboken. We recently completed an under stair custom wine cellar in one of these stunning Hoboken brownstones. The homeowner contacted Joseph&Curtis to design a custom wine cellar under the stairs leading from the basement level to the parlor level. When we arrived the space under the stairs was predictably filled with junk. We recognized the potential for this space to be transformed into a beautiful custom wine cellar and began the design. We transformed this space to a under-stair wine cellar that holds nearly 400 bottles! Wood wine racks that follow the descent of the stairs can be seen behind frame-less glass doors. A custom cooling system ages this wine collection. Under-stair wine cellars make these unused spaces stunning additions to a home. Our latest wine room’s building was Built in 1867 and fully restored in 2016. It offers a modern interpretation of the classic Soho loft building, balancing perfectly restored cast iron detailing with a modern take, and the owner wanted to create the same design for what would become the wine cellar. The room was a full finished bathroom that the owner was willing to trade for a “one of a kind” custom wine room. We had to gut and 100% renovate the space with vapor barriers, insulation, climate control, lighting, temp probes, and everything that comes with working in these incredible spaces in New York City (NEVER easy). Joseph and Curtis designed what we think is one incredible wine room, with acrylic floating wine racks, led lighting, marble flooring, hidden climate control, and touches of black walnut to match the existing space. This modern wine room has capacity of just over 985 bottles and can house 750ml, 1.5ml, and up to 3ltr bottles. The townhouse is close to dining, cafes, fashion, parks & play, retail, and arts & culture. This building within the fabled SoHo Cast Iron Historic District, is one of the most desirable locations, and so is the owners new wine room. Great Oregon Pinot Noirs are highly sought after and this upper east side wine collector has some of the best. He quickly outgrew his wine fridge and wanted a more long term wine cellar solution for his growing wine collection. This glass and metal wine cellar is directly adjacent to his custom made dining room table and needed to be both beautiful and hold as many bottles as possible. There was existing HVAC equipment encased in cabinets on the lower section of the wall that could not be relocated. Above this was ‘dead space.’ We designed and built a custom glass wine cabinet that sat on top. The client likes to boast that ‘Joseph & Curtis gave me 450 bottles of custom wine storage and I didn’t lose a single inch of living space.’ The result is a stunning glass & metal custom wine cabinet with LED lighting that showcases this wine collection to dinner guests at his upper east side penthouse. Our recent build-out in Southampton NY was just completed and we think you will enjoy us sharing the experience. The room was designed to be aesthetically pleasing with many display wine racks and yet practical for storage. The owner wanted to be able to see the majority of the labels for storage ease for a minimum 1500-bottle capacity. We designed wine racks which are installed floor and ceiling so the shiplap backing would be visible. The end result is a warm and inviting room which is large enough to fit a good-sized tasting table as well as some artwork in different areas of the space. The climate control is ducted in and engineered so that you do not see any of the mechanicals in the space. This custom wine room is capped off with a door entry system which is both glass and metal. Please be our guest and browse through this incredible Joseph & Curtis wine room now featured in Southampton. New York’s West Village has always been known as the cool NY neighborhood. Minetta Tavern, Cafe Wha (where Jimi Hendrix got his start in NY) Magnolia Bakery. The Shephard Building, an old warehouse built in 1896 at 275 West 10th Street was recently converted to residences. The Naftali Development Group along with Beyer, Blinder, Belle Architects ‘re-purposed’ this amazing property. he will never go without fine wines. Custom wine cellars are now a must have in NYC apartments . From reach-in wine cabinets to walk-in wine cellars. Every inch of the very expensive NY real estate must be carefully prioritized for kitchens, bathrooms, bedrooms and a Joseph & Curtis Custom Wine Cellar is now on that list of priorities. We recently joined the gut/renovation of a spacious apt on New York’s upper east side. The apt boasts stunning views from every window. Pre-demolition there was an angular space off the living room that previously served as a wet bar. The owner immediately saw this as an ideal spot to store his impressive wine collection. This New York residence is both modern and timeless at the same time. We designed this wood & metal custom wine cellar to echo that style. We used the Joseph & Curtis Wine Gallery metal series wine cradles to show off his best bottles . Wine cellars are often found in basements. This NYC custom wine cellar is on the 31st floor. The NYC skyline and the stunning wine cellar will compete for the attention of guests visiting this amazing upper east side residence.